1BlessedNatural: My Review of Glasseshop.com! Recently, Glassesshop.com sent me a pair of free glasses to review. As you may know, I did a review on them 2015, and I've been loving their site ever since! You can order prescription sunglasses and eyeglasses from them. One of the things I loved about Glassesshop.com from the beginning is you can upload a photo of yourself to the website and see how your glasses will look on you. I also love the fact that they have lots of cool glasses frames you can choose from. This time, I picked the Jersey Rectangle - blue prescription glasses. Let me tell you all a secret... I was rushing and did not read the fact that the glasses I chose were kids size. Womp womp! No one will ever know! LOL. The good thing is I can still pull off wearing them! Thank God! If you're looking through the site, please be sure to read the description fully. Don't be like me. LOL! You can track your order on the website by entering your tracking number in the box at the top of the page. If you have any questions, Glasseshop.com has a "Live Chat" link that will allow you to chat directly with a customer service representative. You can also call or email them using the contact information at the bottom of the page. My glasses arrived in a small white box. When I opened it, the glasses were in a clear white case with Glassesshop.com printed on it. Use my coupon code GSHOT50 to get 50% off of eyeglasses and sunglasses with free lenses! This code does not include frames that are on sale. If you invite your friend to the site, you can get $10.00 off when they use your coupon code. Your friend will also get 50% off of their first order! 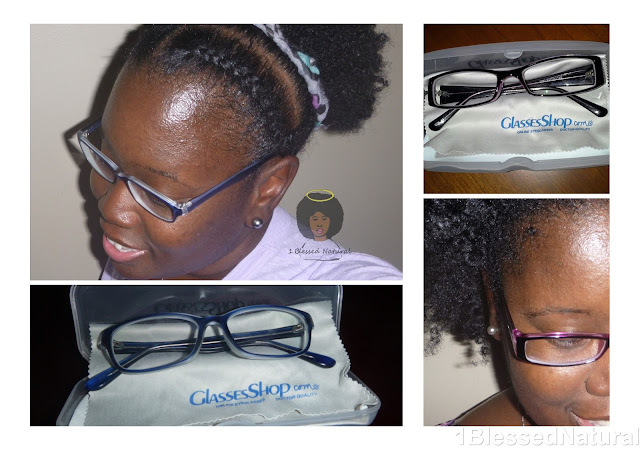 Check out the Glassesshop.com website for more details!